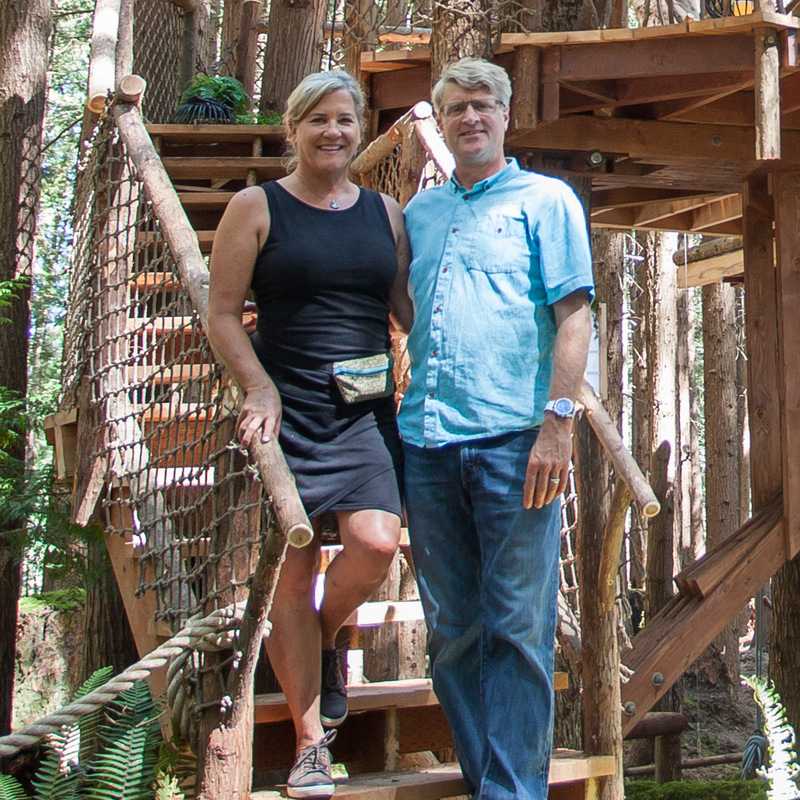 Did you see Friday night's episode of Treehouse Masters? Read on for behind-the-scenes details (including Patrick's reminiscences of the build and a statement from our clients at For-Mar Nature Preserve) and a photo tour of Nature's Super HQ treehouse! Building Nature's Super HQ Treehouse for For-Mar Nature Preserve in Flint, Michigan was such a rewarding experience. Pete and the crew loved creating a place where kids and grownups alike can learn about the environment and connect with nature. Pete was especially inspired by the lore of The Preservers, a band of superheroes tasked with protecting nature and educating others about the environment. Pete is grateful to have been made an honorary Preserver, and is proud to welcome everyone to the barrier-free For-Mar treehouse. According to For-Mar, the treehouse has garnered over 28,000 visitors since opening in August! Find out how you can visit the arboreal home of The Preservers here. Patrick Willse led the build at For-Mar, and reminisces happily about the collaborative and welcoming experience. Since the treehouse is situated in a public park, many folks strolled by as the crew worked, and expressed their excitement about the project. According to Patrick, it was extremely humbling to meet so many compassionate residents of Flint; he and the rest of the crew felt very welcomed and appreciated. Many passerbys even generously offered the crew food! Patrick especially enjoyed trying the local delicacy of cheese coney hot dogs, a once-popular lunch staple for the many Flint factory workers. Toward the end of the build, the local Tasty Layers Custom Cakes brought the crew an outstanding cake replica of the treehouse. In Patrick's words, the cake was, "the most ridiculously awesome replica of a treehouse in cake form that I have ever seen!" PATRICK'S PHOTO OF AMAZING CAKE REPLICA OF THE TREEHOUSE, BY TASTY LAYERS CUSTOM CAKES. Another highlight of the build came when a group of volunteers from the Genesee County Parks system helped build the wheelchair-accessible ramp. These volunteers were exceptionally hardworking and capable, and made quick work of the ramp decking and handrails. Patrick and the crew are so thankful for these heroic volunteers; no doubt that The Preservers would be proud of their selfless giving! PATRICK'S PHOTO OF THE WONDERFUL VOLUNTEERS FROM GENESEE COUNTY PARKS. Patrick also loved working with artist Jason Hulfish, who created amazing representations of The Preservers to hang inside the treehouse. Jason Hulfish Design Studio has worked with NT&S in the past - you might recall Jason's incredible murals and feisty boxtrolls in AJ's wish treehouse from 2014. ARTIST JASON HULFISH CREATED THESE FANTASTIC REPRESENTATIONS OF THE PRESERVERS! Spending a few summer weeks in Flint was a sweet and memorable experience for the whole crew. We are so thankful to all the folks at Genesee County Parks who made it possible for us to build the Preservers' HQ, and are humbled by the hospitality and kindness of everyone we met in Flint. In a city that has experienced much hardship, it is incredible to find such a strong sense of community. We hope that you can visit For-Mar treehouse and experience the resiliency of Flint for yourself. Parks Director, Amy McMillan, explains that working with the crew from Treehouse Masters and Animal Planet was a wonderful experience. They were all very friendly and willing to go above and beyond to deliver a unique treehouse for our visitors. And in regards to her and For-Mar’s Head Naturalist, Nicole Ferguson’s, expressions in the episode when they see it for the first time, Amy explains, “I am an incredibly curious person who does not like to be surprised, ever, no matter how great the surprise is, so keeping my promise to wait until the reveal to get my first-ever look at the treehouse was harder than I imagined it would be. I wanted to peek every single day and I desperately wanted to be part of the Parks crew that got to help with a small part of the build, so I was more than a little grumpy whenever people told me how great the build was going. But that all went away when I saw the treehouse for the first time. It was magic”. Thank you for your kind words and hospitality, Genesee County Parks! We wish you many happy years of learning and playing in the trees! JASON HULFISH DESIGN STUDIO CREATED THE AMAZING REPRESENTATIONS OF THE PRESERVERS THAT PROTRUDE FROM THE TREEHOUSE WALLS. We hoped you've enjoyed taking a look behind the scenes of Nature's Super HQ Treehouse! Follow us on social media and subscribe to our mailing list to stay updated on photo tours of treehouses featured on Treehouse Masters! Catch the next episode of this all-new season of Treehouse Masters next Friday, January 20. To the trees!